At CES 2017, Dell launched the new XPS 15 laptop, a Rose Gold variant of the XPS 13, and the XPS 27 AIO. The company also refreshed the current Dell XPS 13 range with seventh generation Intel Core processors. As for the new Dell XPS 15 (seen above), it has been priced starting $999.99 (roughly Rs. 70,000) and will go on sale from Thursday. Also going on sale on Thursday is the Dell XPS 27 AIO, priced at $1,499.99 (roughly Rs. 1,02,200). The Rose Gold variant of the Dell XPS 13 on the other hand is available now in the US at a starting price of $799.99 (roughly Rs. 55,000). The new Dell XPS 15 comes with a choice of 15.6-inch full-HD (1920×1080 pixels) InfinityEdge or UltraSharp Ultra HD (3840×2160 pixels) InfinityEdge touch displays. The Windows 10 laptop is powered by a choice of seventh generation Intel Core i3-7100H processor (up to 3GHz), Core i5-7300HQ (up to 3.5GHz), or Core i7-7700HQ (up to 3.8GHz). The laptop comes with 8GB of 2133MHz DDR4 RAM, going up to 16GB and 32GB configurations. Apart from Intel HD Graphics 630, users can also opt for Nvidia GeForce GTX 1050 dedicated GPU with 4GB of GDDR5 video RAM. As for storage, the new Dell XPS 15’s base model comes with a 500GB HDD+32GB Flash, or a 1TB HDD+32GB Flash with Intel SRT, or, 256GB, 512GB, or 1TB PCIe SSDs. Ports on board include HDMI, 2xUSB 3.0, headset jack, SD card reader, and Thunderbolt 3. Other connectivity options include Wi-Fi 802.11ac and Bluetooth v4.1. It is powered by a choice of 56Whr or 97Whr batteries. 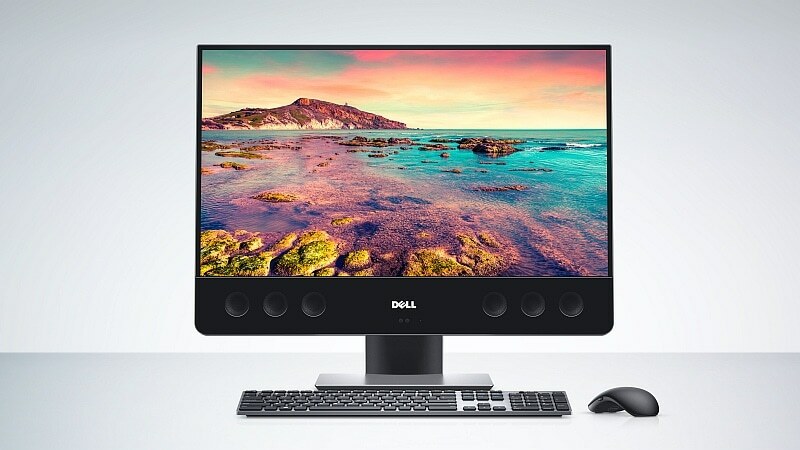 As for the new Dell XPS 27 AIO (seen above), it ships with a choice of 27-inch UltraSharp 4K UHD (3840×2160 pixels) touch display (300 nits) or UltraSharp 4K UHD (3840×2160 pixels) InfinityEdge display (350 nits), both with 100 percent Adobe RGB panel for enhanced colour accuracy. The touch display has articulated tilt mechanism on the stand. The Dell XPS 27 AIO comes with a choice of sixth generation Intel Core i5-6400 processor (up to 3.3GHz) or Core i7-6700 processor (up to 4GHz), coupled with Intel HD Graphics 530 integrated graphics. Users will have the option to choose the AMD R9 M470X (2GB GDDR5) or AMD R9 M485X (4GB GDDR5) dedicated graphics. The base model comes with 8GB 2133MHz DDR4 RAM, going up to 32GB. As for storage, users can opt for a 1TB SATA HDD (2TB option also available) or 2TB SATA HDD + 32GB M.2 SSD with Intel RST, or, 512GB/ 1TB M.2 PCIe SSD. The Windows 10 AIO has 1xUSB 3.0 port, 1 SD card reader, and one audio jack on the side, while the back sports 4xUSB 3.0 ports, 1xDisplayPort 1.2 port, 1xThunderbolt 3 port, 1xGigabit Ethernet port, and one audio out port. The touch variant measures 625x435x80mm and weighs 17.3kg, while the non-touch variant measures 613x435x82mm and weighs 13kg. As for the refreshed Dell XPS 13 series with the seventh generation Intel Core processors, users can opt for either an Intel Core i3-7100U, Core i5-7200U, or Core i7-7500U processor with Intel HD Graphics 620 integrated graphics. While the base model ships with 4GB of 1866MHz LPDDR3 RAM, apart from 8GB and 16GB configurations. Users also have a choice of 13.3-inch full-HD (1920×1080 pixels) InfinityEdge display or 13.3-inch QHD+ (3200×1800 pixels) InfinityEdge touch display. Storage options on the new Dell XPS 13 include 128GB SATA SSD, or a 256GB/ 512GB/ 1TB PCIe SSD. It ships with a 60Whr battery. Connectivity options include Wi-Fi 802.11ac, Bluetooth v4.1, 2xUSB 3.0 ports, SD card reader, headset jack, and 1xThunderbolt 3. The touch variant weighs 1.29kg, the non-touch variant weighs 1.2kg, and they both measure 304x200x15mm.